There are a lot of devices and equipment out there to help extinguish fires. From fire sprinkler systems, fire blankets, to fire extinguishers, there are plenty of items to keep you safe in residential and commercial buildings. 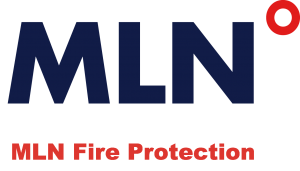 At MLN Fire Protection, we are dedicated to our customer’s safety. No matter where you are, you should always be protected from fire hazards. 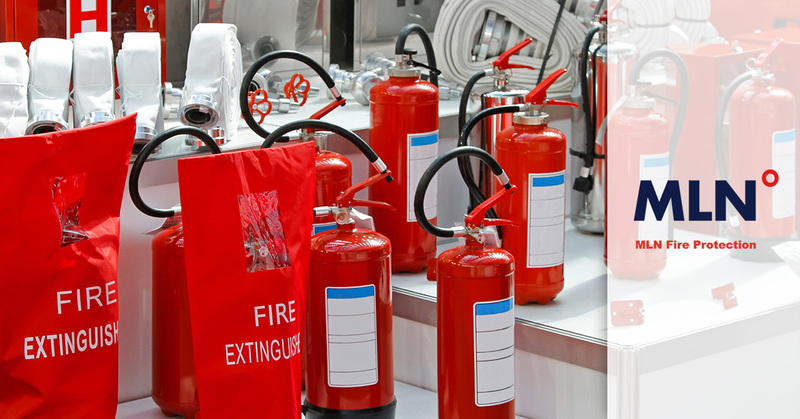 In this blog, we will go over the different classes and versions of fire extinguishers. By reading this blog, you hopefully, will have a better understanding of fire extinguishers and what kind to purchase for your residential or commercial building. There are four types of fire extinguishers, all ranging in the types of fires that they put out. The classes range and are named A, B, C, and lastly, D. These classes are organized by the severity of the fires they put out. For instance, class A extinguishers are reserved for smaller, less severe fire accidents. These extinguishers are designed to put out small or common fires, such as ordinary combustibles, such as wood and paper. These types of fires are very common in office spaces, as small mishaps can happen, such as a piece of paper catching on fire. The B class of fire extinguishers are for fuel or gas-related fires. These types of fires are a bit more serious and should be addressed immediately. In fact, it may be a good idea to pull the fire alarm before you attend to the fire, just to ensure that everyone is clear of the flames. These types of fires are notorious for traveling quickly and burning for long amounts of time. If this type of fire occurs, it is best to make sure everyone is safe from the fire, as well as its fumes. Class E extinguishers are used for electrical fires. These fires are typical when an electrical outlet is faulty or old. Sometimes, too much power can come through the electrical outlet and spark a fire if around cloth or carpet. For office spaces, electrical fires are more prevalent, as there are commonly many networks of electrical appliances plugged into multiple outlets during one business day. With this type of fire, the flames can take awhile to form, which means you will either smell that something is burning before the flames erupt, or your smoke detectors will go off before the fire is fully formed. However, just because these types of fires are slow to burn, they should not be underestimated. This class of fire extinguishers are ideal for oil and grease fires.These types of fires are very dangerous because they burn hot and fast. Because of this, it is best to stay far away from a grease or oil fire until the professionals come. If you see a fire erupt from grease or oil, it is extremely important that you alert everyone in your building that there is a fire. There are plenty types of fire extinguishers, all ranging in the types of solution that they spray out. For instance, different fire extinguishing devices will have different ingredients in their canisters and specialize in certain types of fires. For instance, you are probably used to seeing the common water and foam fire extinguisher, which is ideal for small-scale paper or wood fires. In this guide, we will be going over the different types of fire extinguishers and what fires they specialize in. By reading this guide, you will be able to purchase your fire extinguisher based on the types of fire the device specializes in. This type of extinguisher is able to put out a fire by taking way the heat of the flames. The foam agent in the solution separates the oxygen in the flames to help suffocate the fire. These types of extinguishers are generally Class A extinguishers only. For Classes B and C, these types of fires will actually do more damage than good. For instance, in a Class B fire, this foam and water extinguishers could spread the flammable liquid around and cause more damage. And, for Class C fires, this extinguisher could create a shock hazard. This type of extinguisher uses carbon dioxide to take away the oxygen of the flames and the heat by releasing a cold discharge. When carbon dioxide is released its temperature chills the flames and, thus, puts out the fire. This extinguisher is ideal for Class B and C fires, however, for A fires it can be ineffective. Dry chemical fire extinguishers is a multi-use device, in that it can be used for fire types A, B, and C. That is the most common fire extinguisher for this reason. It is important, however, if you are using this type of extinguisher that you only use the dry chemical extinguisher for certain B and C fires. If you try and use this type of extinguisher for type D fires, it could actually reignite the fire and make the situation worse. Wet chemical is a new agent that extinguishes a fire by removing the heat of the flames and prevents reignition.This type of extinguisher is developed for grease fires, mostly seen in cooking operations. If you own a business where cooking is essential, having a kitchen-specific extinguisher, such as a wet chemical fire extinguisher, is helpful. Halogenated, or clean agent, fire extinguishers are made with halon agents, which is a chemical reaction extinguisher that reduces the heat of a fire. This type of device is effective for Class A,B, and C fires. If you have one of these extinguishers, however, you will need to ensure that it is of a certain size. Why? Well, smaller sizes of this type of extinguisher will not hold enough solution to fully put out a fire. Dry powder extinguishers are similar to dry chemical extinguishers because they both work to put out fires by separating the fuel from the oxygen and by removing the heat from the individual flames. Though they work similarly, the two extinguishers fight very different fires. Dry powder extinguishers are meant to be used for more severe fires, such as those in class D. This type of extinguisher is also useful for combustible metal fires as well. These types of extinguishers are particularly specialized devices that spray water to reduce the heat of a fire. These extinguishers are meant to only be used for class A fires, such as small cloth or wood fires. Water mist extinguishers are especially useful for small fires that don’t require a full-sized extinguisher. These types of extinguishers use stored pressure to put out fires, similar to traditional dry chemical extinguishers. This type of extinguisher is helpful for class A, B,and C fires. Typically, dry chemical extinguishers are meant to be used for class B and C fires only. It is important to use the right extinguishers for each fire situation. If you use a dry chemical extinguisher for the wrong fire, you could run the risk of re-igniting the fire. As you can see, fire protection can be a complex subject. A fire extinguisher can range from the solution it expels to the type of fire it specializes in to put out. As you can see fire protection can be a broad subject that requires some expertise. 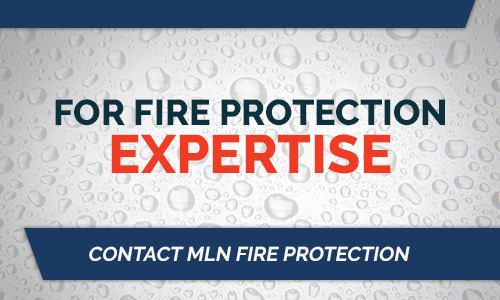 At MLN Fire Protection, our knowledge goes well beyond just fire sprinkler systems. We are able to help residents and business owners in Houston understand their fire protection systems in better, safer ways. To learn more, give us a call today!